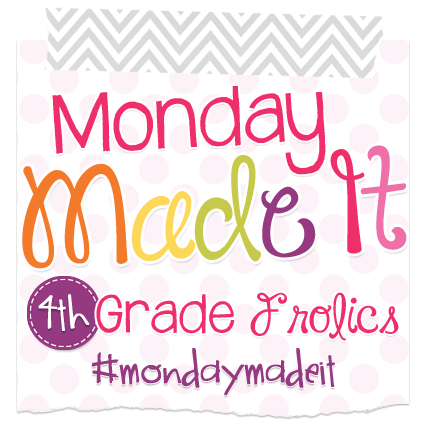 I am linking up with Tara for my all time favorite linky! I am so grateful to her for throwing this each week in the summer and during the school year!!! First, I have to say I only made 2 made its this week that I am going to post. Only because I have about 156,849 of things that are half done that I need to finish before the school year starts. I go back on August 20th! BLAH! 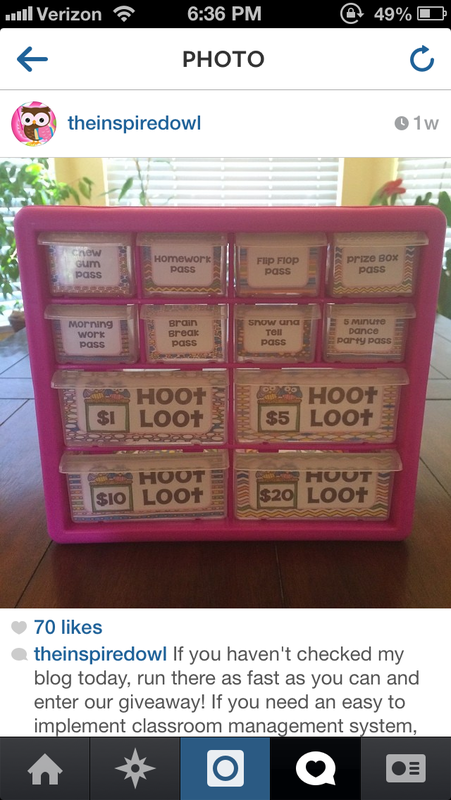 So I was browsing through my instagram and @theinspiredowl on IG posted this awesome picture of her behavior system, and I was like WHOA! First - it is so cute and tiny - Second it was PINK! Holla! I asked where she picked it up and let her know that I bought one for the same reason! It is so cute! 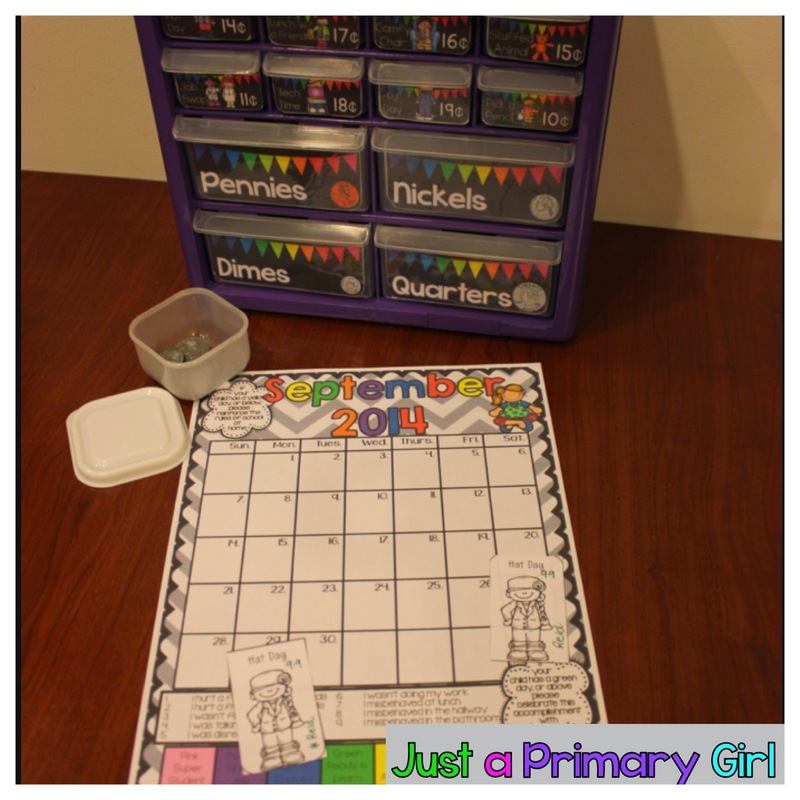 I am so excited to organize my behavior stuff this year. Last year was ok, but this year because of this box, it will be amazing. Click on her picture and you will see her ideas and so many fabulous pictures! 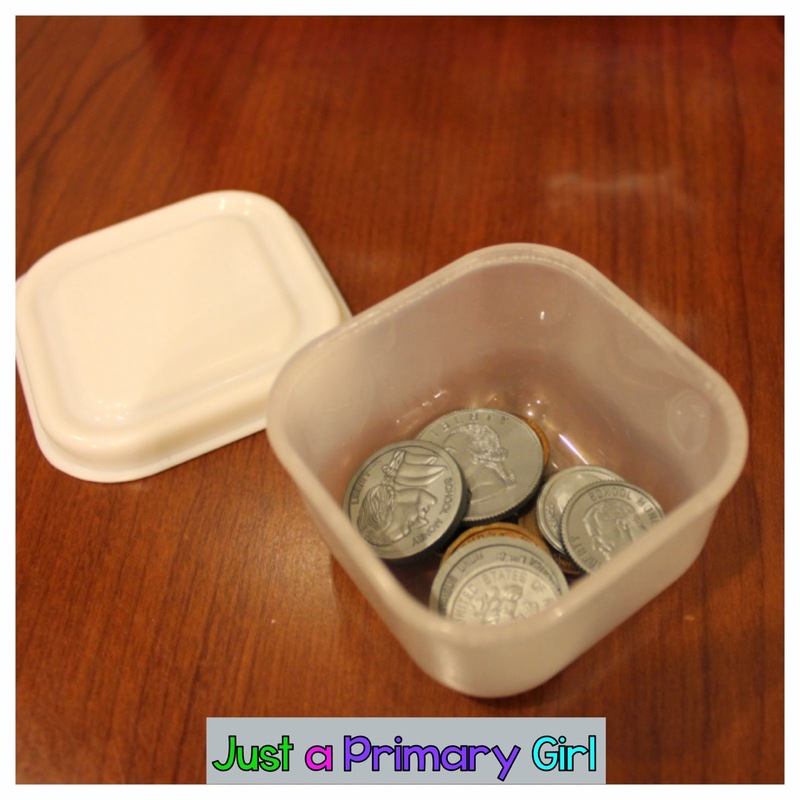 Anywho, in my class, I use coins as my behavior plan and have since I taught kindergarten. 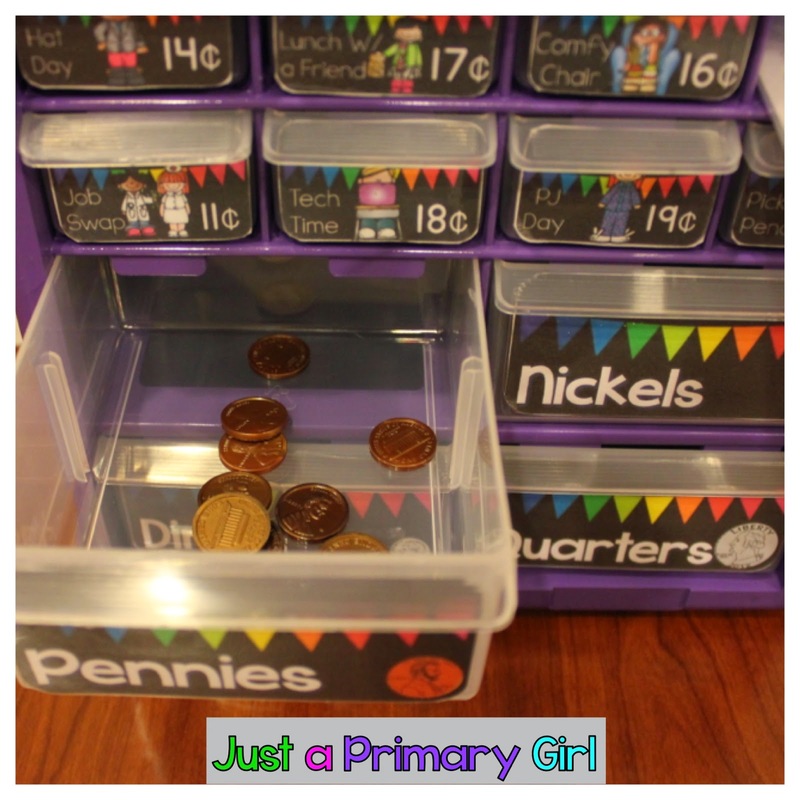 I enjoy using coins as my behavior plan because the students enjoy it, it reinforces counting coins, and it is easy to manage!!! This year, I decided to make this cute little guy! I got it from Amazon. Although Walmart does have it as well. They are both the same price. These are the only two places I was able to find it. I am BEYOND excited about this adorable little thing! So here is how it works in my classroom. During the first nine weeks of school, my students only earn pennies. They can earn them by helping a friend, listening to directions, or just doing a good job. I make sure that I give all students at least a few, especially the ones that may not get them easily. I only do pennies because I want them start slowly with coins and counting. I don't want them to be too overwhelmed. 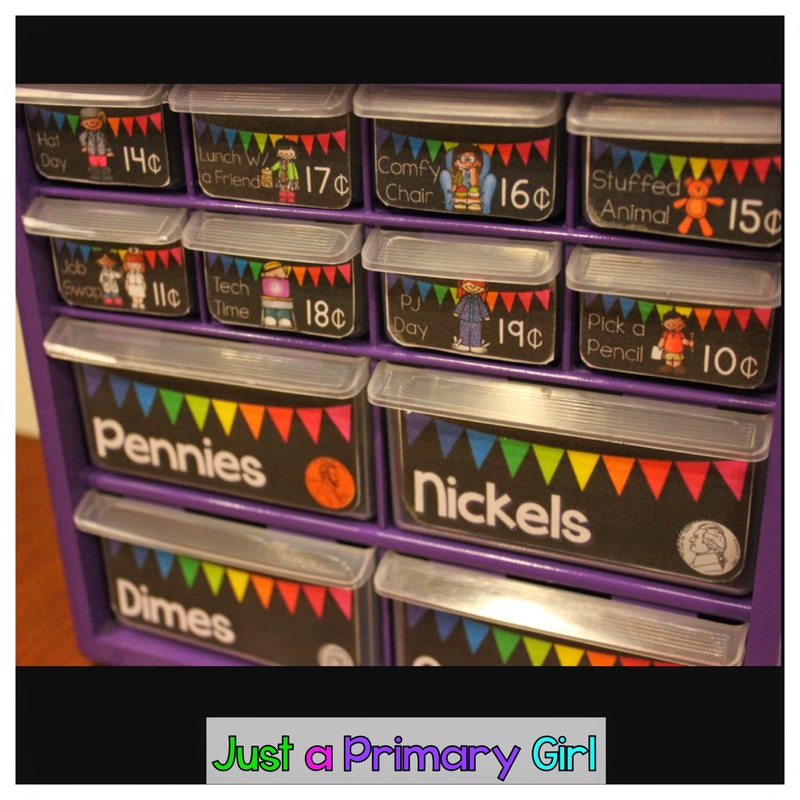 The kids that know money already could care less that I only do pennies. I bought these containers from Dollar Tree years ago. I have the students' numbers on the top and the bottom - you have no idea how many times a lid pops up in my lost and found bin. Students keep their coin bank in their desk. As they earn money it goes in. If they count it during an inappropriate time, they lose a coin. If they only happen to have one coin or that one coin is say a quarter - tough lesson. They realize really quick to only count during their free time. I stopped doing actual prizes three years ago. I had great parents buying or donating gifts, but it was just a hassle to store! I had a huge treasure chest that I finally gave away. That felt great!!! Last year, I had a binder of prizes and the kids had to figure out what they wanted and that took forever as well! When it is time to purchase items, I call in a parent to help. 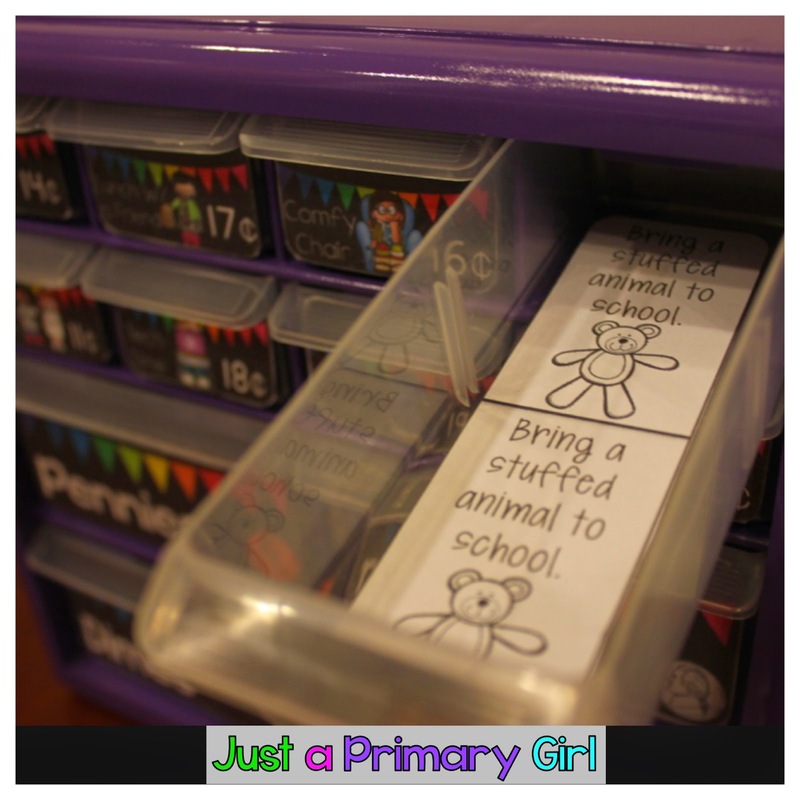 The have a little supply bucket that has scissors, a pen, date stamper and the bin above. In order to "buy" a prize, they have to be able to count out their money!!! For the kids that whip through this, the parent will talk about change with them and ask them how much is left over, how many items can you buy with x amount. It is GREAT! I got the idea to use prizes that didn't cost a thing and it has been heaven. I feel like these kids work so much harder for these "gifts". They are proud of them. Last year, they would always ask if I could send a note home to their parents about what the prize was. Well, for one, I couldn't remember what they bought, I had sticky notes everywhere and still had a mess of kids trying to say they already bought blah blah. It was a mess. Enter my idea here. I put TWO of the same thing on one piece to go into my drawer. 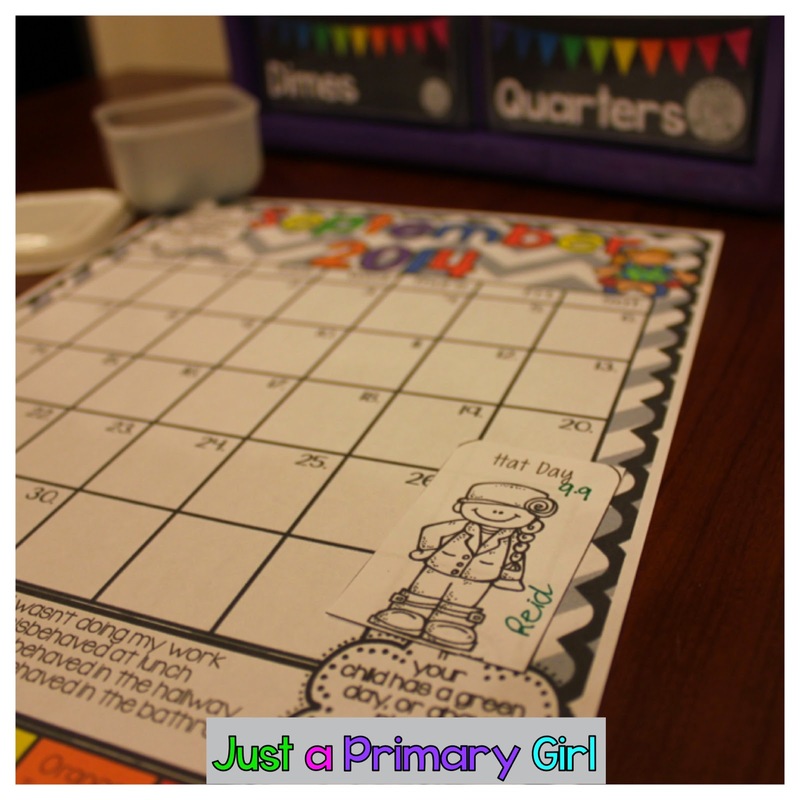 The first one, gets the kids name and the date they will redeem or did redeem their item - I keep it on my "prize board" That way I can reference it and make sure I give the kid that bought line leader their reward. It is easy to forget. The second one gets the same thing, but it goes HOME with the student. Parents know we shop bi-weekly (especially until Christmas) then usually weekly after that. They are on the lookout for the little slip. I staple it to their behavior chart. It is fun to see at the end of the month how many they have stapled on the back at the end of the month. If they can afford it, they can purchase. Some kids save a really long time because I talk about how the prizes change and will get better over time. They get so excited. Bless their hearts for waiting an entire nine weeks to see the prizes change. Lunch with me is a big one. So I make it $1.00 - I have only had a handful of kids get it each year, but dang they are excited. My time is valuable and I only reward it to those who deserve it. The bins keep the coins in it, so I can tell a kiddo to go grab a penny etc. when they did something great. I also use my clip chart and reward from there. If you have a green day you get nothing. A blue day a penny, above 2 pennies etc. As the nine weeks go on, I increase what they can be rewarded. This is also the reason we shop more often. This is what it will look like except the date will be stamped. 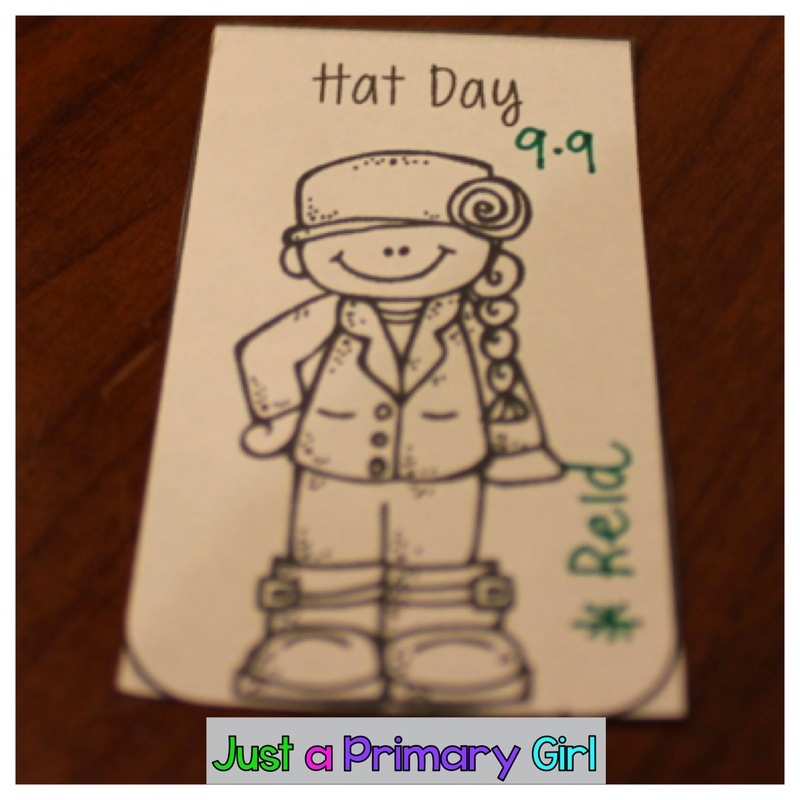 The parents will know that the date is the "redemption date", so this means that child should wear a hat to school on 9/9. I just love how it turned out. I also have a large choice board so they can see all the prizes and costs without standing in front of the bins while another kiddo is shopping. If you are interested in me making this a sort of editable pack, please let me know and I would be happy to post it! 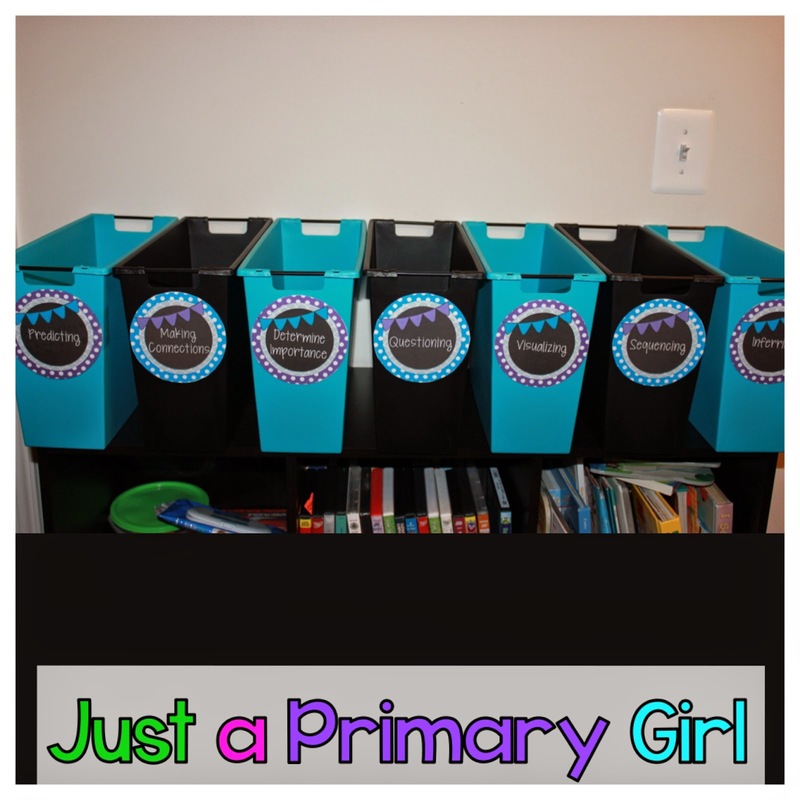 My last made it - I can't WAIT to put these in my classroom tomorrow!!!! I went to 6 different Big Lots across my county to get enough for my classroom read alouds, and dagnabit, I did it! I have 30 of them and can't wait to fill them up. I hope I have enough, because I don't have time to search for any more!!! 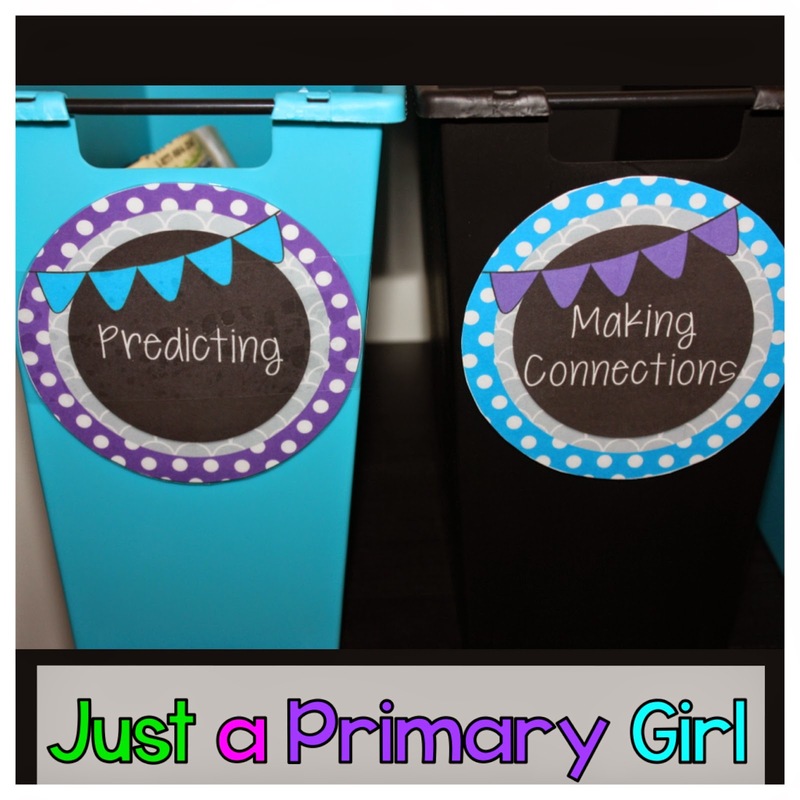 I am also working on putting this editable file in multiple colors on to my TPT page for you all as well. I hope you enjoyed all of these! I have a big test tomorrow at 7 am, so I gotta get to bed, so a Sunday night Made it, it will be! Love the money reward/behavior system! Would love to have it available in an editable version. I always did something similar at the end of the year because it was so much work to manage. 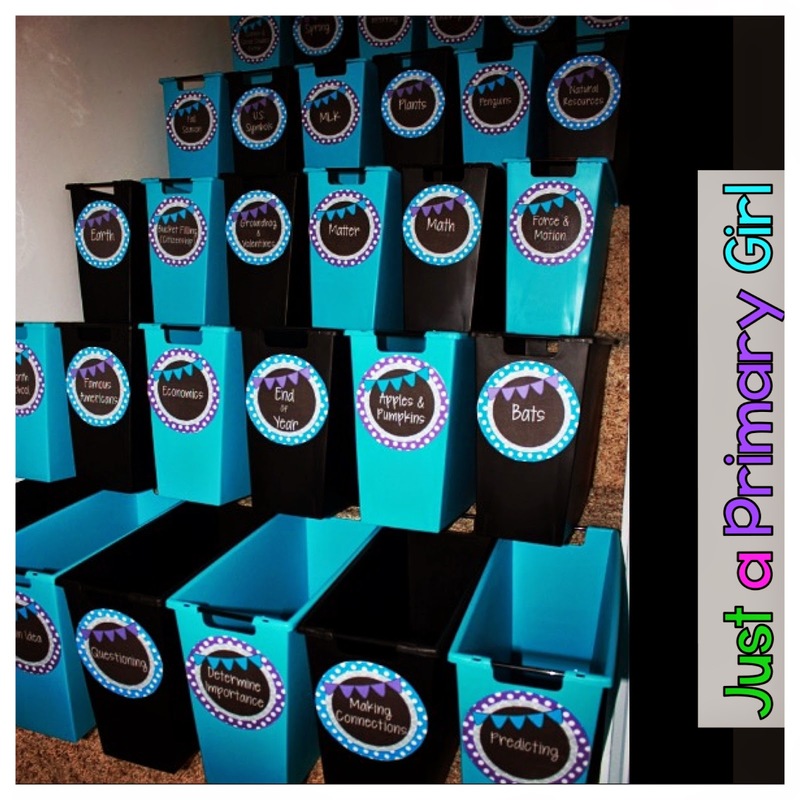 Love the idea of having a parent helper! I love your system and would purchase it in a heartbeat! I like how you manage the rewards with the slips. 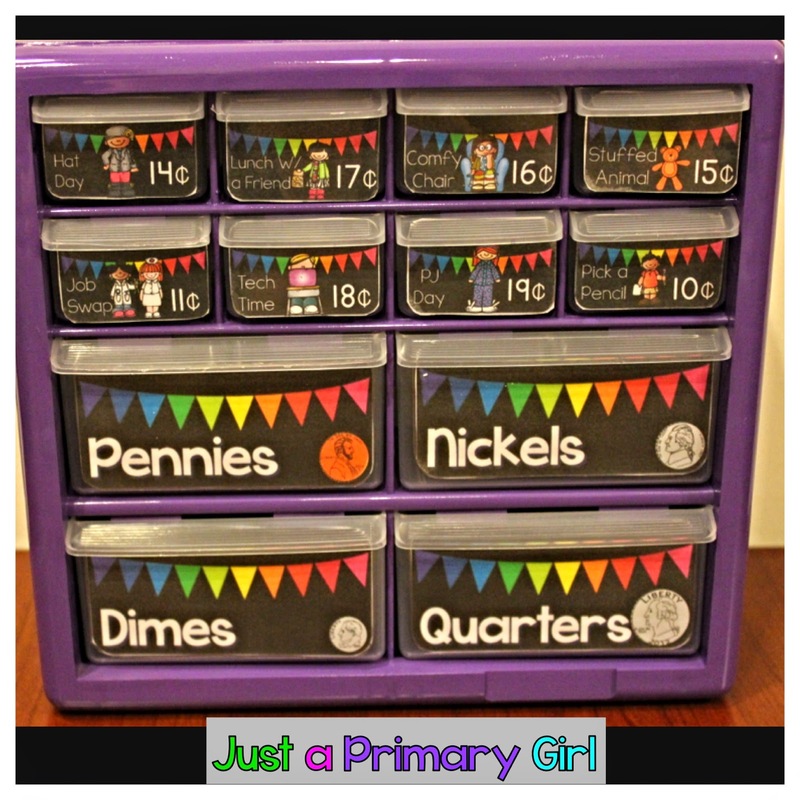 I have a similar system but I was always dealing with sticky notes and forgetting who paid for what. Great idea! The money management system is genius! And I am so jealous of those beautiful bins. Heading to Big Lots tomorrow! LOVE the money management system! What a great idea! I tried to follow your blog but there is no way to do so. If there is, please let me know. Love the bins too! Great colors! Love your reward system! Also I feel you I have hunted for those bins at every big lots! 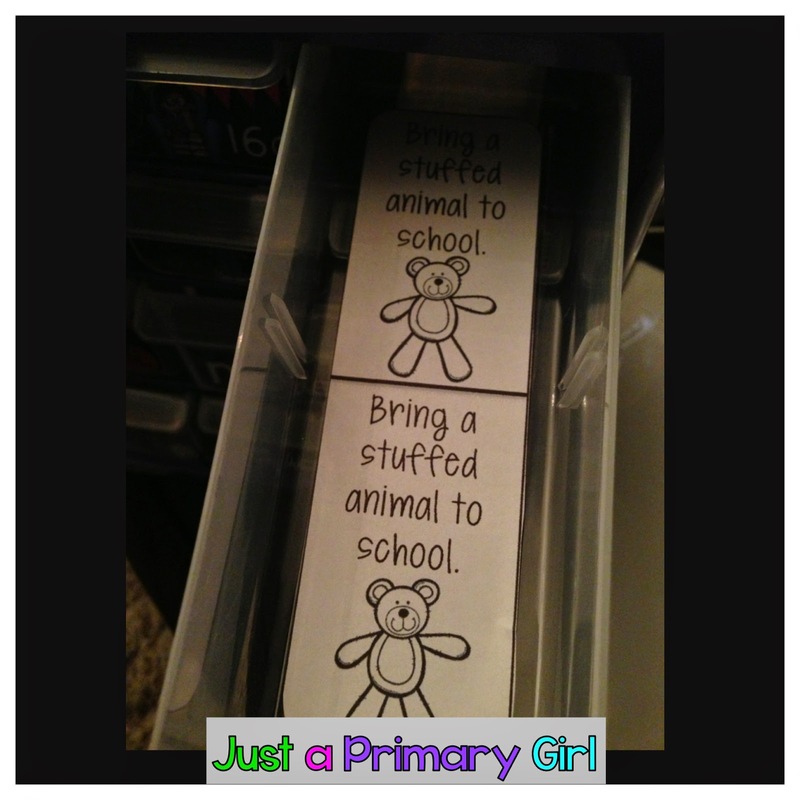 So I will be purchasing your labels, they look great! Thank you for your sweet shout out! My kiddos are loving the coupons so much! I might go broke buying gum, though, LOL! Hi! 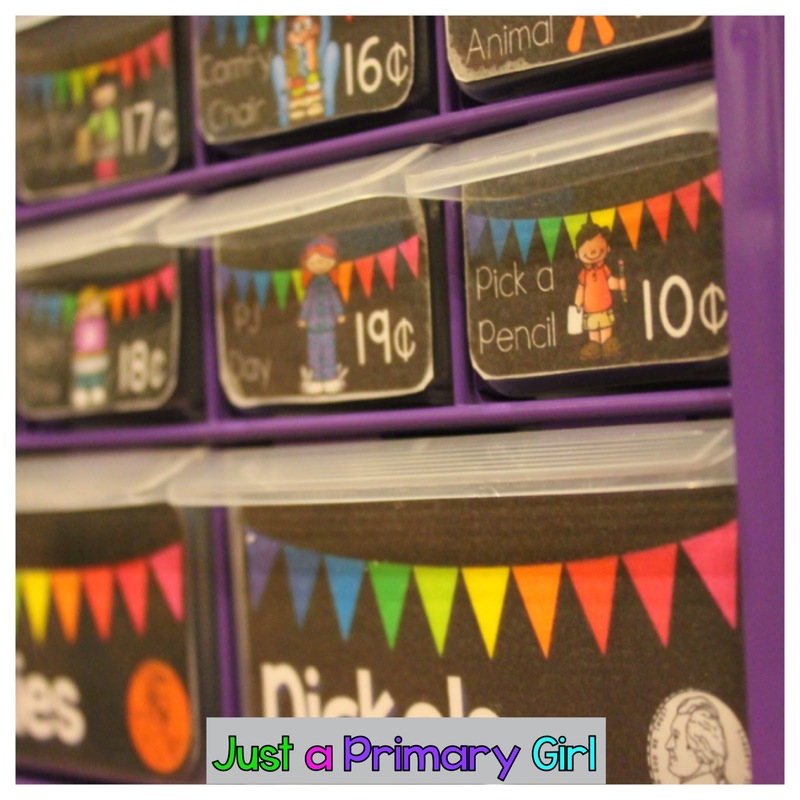 Just wondering if you ever posted these labels in your TpT store? If not, is there a chance they might be made available to purchase? I do something similar to this now but would love to update it! Thanks so much!